Hesiod and Aesop tell stories which are superficially similar but illustrate morals with diametrically opposite meanings. Both concern a bird of prey tormenting a seemingly helpless victim, but their endings reveal a fundamental difference in philosophy of the respective tellers. 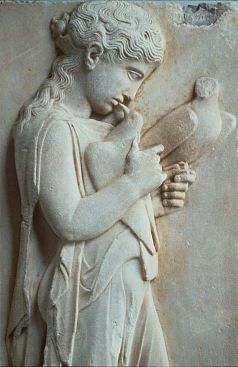 In Hesiod's fable, a hawk seizes a nightingale. When it complains, he answers with a speech that conveys the story's moral. "Only a fool will match himself against a stronger party, for he'll only lose, and be disgraced as well as beaten." In other words, might makes right. Those in power have no responsibility to treat others fairly. The story illustrates Hesiod's pessimistic world view. In this view, there is no higher authority than the local king, magistrate or other bully. If one is treated badly by a stronger party, there is no eventual justice to hope for. It is best to submit meekly and hope that the bully will be inclined to let you live. The Aesop fable uses a similar cast of characters to tell a different message. An eagle and a vixen become friends, but the eagle abuses her power of flight to eat the vixen's young and escape. The vixen is as helpless as the nightingale was in Hesiod. "All she could do was stand far off and curse her enemy--like any weak and feeble creature." If the story ended now, it would teach the same message as the Hesiod fable. The strong can abuse the weak without fear of retaliation. However, in the world of the Aesop fable, there is a higher power than that of the strongest local creature. The world is ruled by justice, which may be a natural phenomenon or dispensed by the gods. For the eagle, which violated the "sanctity of friendship," is punished by suffering the same fate which she inflicted. A bit or burning offal snatched by the eagle burns her nest, dropping her young to the vixen, who eats them. In Aesop's story, it is clear that good and bad acts are rewarded or punished not by mortal beings, but by the power of the gods or of natural justice. Aesop's is essentially an ordered and moral word to Hesiod's chaotic and amoral one. The morality of the Aesop story is one based on fear of punishment. It shows the same "eye for an eye" justice as does the Hebrew bible. The eagle who eats another's young has her own eaten, and thus justice is served. The different philosophies of the two storytellers may be based on fundamental differences of personality. Hesiod considers himself essentially rational. Although he believes in gods and in the necessity of appeasing them, he thinks that the best way to serve one's own interests is to take care of oneself, and to make the best of a bad situation even if one is abused by a hawk or by one's greedy brother. The storyteller of the Aesop fable believes in a world where the best way to prosper is to be virtuous. Evil actions may net short-term profit, but such profit is paid for by suffering in the end. Of course, there is another explanation for the existence of two such opposite fables. It is clear that the hawk would prefer to hear the first, while the nightingale would prefer the second.